Fill a dish tub halfway with uncooked white rice. Bury age-appropriate, high-interest, small presents (up to 10 items) in the rice. Examples are toy cars, plastic animals, army men, trading cards, etc. Tell you child how many toys you buried and ask him or her to find them. Count the toys as the child finds each one and talk with him or her about the object. This task encourages tactile discrimination and desensitization, math skills, and social skills. The child should help you construct the viewing box. Cut two holes on opposite sides of a larger box. You could also make a box tunnel using several connected boxes. The holes should be large enough for the child to crawl through. Poke holes in the top of the box to create the stars. String popcorn for snowflakes and hang the strings from the top of the box into it. Start with a few strings and then increase them as your child becomes more comfortable in the enclosed tactile space. Use packing peanuts to coat the bottom of the box with “snow.” Encourage your child to crawl through it. This task encourages tactile discrimination and desensitization, control over activity, and moving through spaces of various sizes. Create a pond-shaped racetrack from poster board on your table. Place two cotton balls on one side of the track at the starting line. Give your child a straw to blow through. Have your child blow the cotton balls (snowballs) to the other side of the track. This task encourages breath control, eye control, and lip control. Attach a blunt threading needle to a piece of string or elastic. Allow the child to poke the needle through each marshmallow and string a bracelet. When the bracelet is finished, tie it to your child’s wrist and encourage him or her to eat the marshmallows. This activity goes well with hot chocolate. It encourages eye-hand coordination, fine motor control, and tactile discrimination. Gather unique objects such as baby carrots, licorice strips, and buttons. 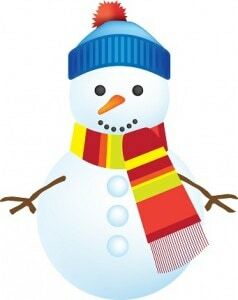 Give the child a piece of paper and paint and encourage the child to use the objects to paint a snowman. This activity encourages tactile discrimination, control over activity, and developing a pincer grasp. Prepare sugar cookie dough according to the package directions. Roll the dough flat and have your child help you cut the dough into pairs of simple shapes (circles, triangles, squares, etc. ), making sure that each shape has an identical pair. Cook the dough according to the instructions on the package. Have your child use his or her clean hands to mix together 1 mashed up banana, 1 cup of marshmallow crème, 1-½ teaspoons of maple extract, and 5 drops of green food coloring. If your child resists, offer a plastic glove to help. Cool the cookies and have your child match the shapes, spreading the maple-banana frosting between them to make sandwiches. This activity emphasizes tactile desensitization, matching skills, and following directions. Using mittens with a variety of colors, textures, and shapes (fingered gloves or non-fingered mittens), have your child match mittens or sort them based upon different traits. Encourage your child to try on different mittens. Talk about what makes the mittens different. This activity encourages social skills and communication, sensory input, and matching skills. Want To Build a Snowman? Using white modeling dough, encourage your child to roll different sized balls from it and build a snowman. Show the child how to roll the dough to make balls. Talk with the child about the different sizes of balls that are needed. Say things like, “This ball is big. This ball is medium. This ball is small. The big ball goes on the bottom.” This activity encourages social skills and communication, sensory input, and hand manipulation skills. Combine 1 cup of cornstarch and 1 cup of glue in a bowl. Encourage your child to mix it together with a spoon until well blended and sand-like. Spread the mixture across a jellyroll pan or other shallow dish. Using a small toy snowplow (or other toy), have your child drag the toy through the sticky material. This activity encourages tactile discrimination and desensitization, strength building, and coordination skills. Have your child tear pieces of white tissue paper and crumple them into balls. Give your child a blue or black piece of construction paper and let them draw a winter picture, such as a moon and hill, snowman, or pine tree. Give the child a small dish of glue and allow him or her to dip the snowflake crumples into the glue before randomly placing them on top of the picture. This activity encourages tactile desensitization, builds hand strength, and increases coordination skills.